It’s often argued that a home is an investment. A major part of any CLT program is restraining the rise of housing prices. When people express skepticism about CLTs, the most common objection I hear is: A home is an investment, and so by restraining the rise of home prices, CLTs harm ordinary homeowners who are unable to profit off their investment. But is owning a home really an investment for a typical homeowner? A typical homeowner owns a single home–their primary residence. Investing is the act of committing money or capital to an endeavor (a business, project, real estate, etc.) with the expectation of obtaining an additional income or profit. Buying a home as a primary residence obviously meets the first half of the definition: it is indeed an endeavor that costs a lot of money. But what of the second half? Does a home create income or profit? Does a home create income? No. A home might save money relative to renting over the long term (we’ll consider this below), but it doesn’t create income. A home creates income if you become a landlord and rent it out, but we’re interested in a home as a primary residence because most people aren’t landlords. A home does not create income. What about profit? Does a home create profit? Many might say that, yes, a primary residence counts as an investment because home prices tend to rise, thus creating the opportunity for profit. Let’s assume Solomon stays in his home for 10 years. How much would it have to appreciate in value for him to make a profit? That means that when he sells his home, $63,027.17 of the sale price will go to pay off the balance of his mortgage. Putting this all together, Solomon’s home would have to sell for $96,232.40 + $63,027.17 = $159,259.57 for him to break even–or a whopping 59% appreciation in just 10 years. In reality, the cost would have to go up even higher, for three reasons. First, if the value of Solomon’s home was appreciating that rapidly, his property taxes should increase apace. 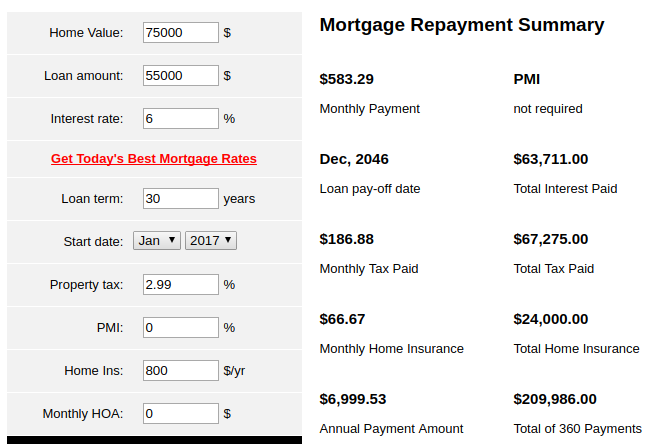 However, the mortgage calculator doesn’t allow me to account for increasing property taxes. Second, home ownership can be expensive. What if Solomon needed to replace a roof, water heater, or furnace, each costing $10,000 or more? While these are very expensive items, even basic maintenance and repairs add up quickly. Finally, when selling a home, Solomon would have to pay realtor’s fees (most homeowner’s aren’t able to sell their home without a realtor). The going rate for realtor’s fees in this area is 4.5-6% of the sale price of the home (for a sale of $159,259.57, Solomon would have to pay his realtor $7166.68 to $9555.57). Clearly, he’d need far greater appreciation to make a profit selling his home after 10 years; at the bare minimum, he would need 59% appreciation. But mortgage costs are at historic lows. What if rates suddenly jumped up and the best rate Solomon could get was 6%? 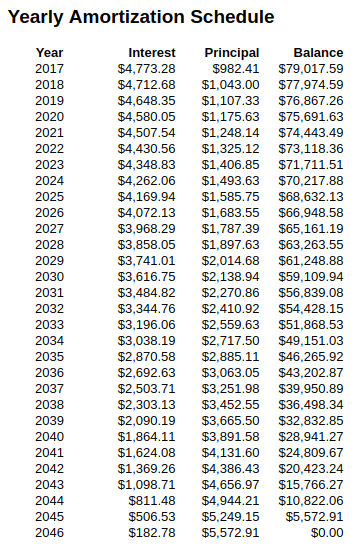 In sum, to break even, Solomon would have to sell his home for $107,956.40 + $66,948.58 = $174,904.98, or a whopping 75% appreciation in just 10 years. Again, this is an absolute minimum value; he would actually have to sell for much higher in order to pay for repairs, maintenance, and increased property taxes–issues which a mortgage calculator cannot account for–and pay his realtor 4.5-6% of the sale price, or $7870.72 to $10,494.30. Clearly, it doesn’t make sense to think of a home as an investment for most people. Unless housing prices rise very rapidly and mortgage rates are at historic lows, a primary residence won’t generate profit. We’ll take on the full significance of this later on. For now, let’s see what would happen if Solomon actually did make a profit on his home. Let’s assume Solomon initially bought a very small home for himself. He was young and was only able to afford a small “starter” home. Ten years later, he wants to sell because he has married his sweetheart Josette, and they now have two children. He’s moving because his home was big enough for himself alone, but it isn’t big enough for a family. Let’s assume that Solomon got extremely lucky. Rates were just 4% and his home doubled in value in 10 years. Per our calculations above, he would need to sell for $159,259.57 in 2027 to break even, but instead he’s gotten fantastically lucky and is selling for $200,000. Solomon walks away with $200,000 – $159,259.57 = $40,740.43 profit. Actually, let’s assume Solomon spent about $15,000 in additional property taxes, maintenance/repairs, and realtor’s fees that the mortgage calculator wasn’t able to account for–let’s call it $25,000 profit to keep round numbers. So, Solomon got fantastically lucky and–because of the rapid appreciation in the value of his home–has sold his home and made $25,000 in profit. He’s in great shape–right? Wrong! He’s not in great shape because he doesn’t have a home. Solomon’s family of four outgrew his home (let’s call this the “starter home”) and he had to sell it. Now he needs a bigger home (let’s call this the “family home”). Let’s assume that Solomon’s family needs a family home that is exactly twice as big as the starter home, and for simplicity, a doubling of square footage means doubling of price. So–Solomon bought his starter home for $100,000 in 2017. In 2017, he could have bought a larger “family home” for $200,000. But it’s not 2017, it’s 2027, and home prices have doubled. 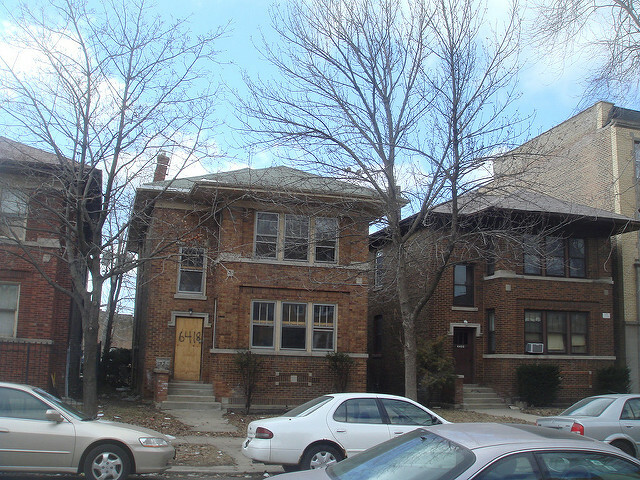 Solomon’s “starter home” doubled in value, but so have all the other homes in the market. As a result, the home he needs now–which would have cost $200,000 in 2017–now costs $400,000 in 2027. So he’s not better off at all; he made $25,000 profit, but the home he needs has appreciated in value by $200,000. He is worse off. He did make a “profit” off his starter home, but that “profit” has been more than offset by the fact that all the other homes in the area have appreciated by the same ratio. His profit was $25,000, but that’s dwarfed by the increase in price (from $200,000 to $400,000) he now needs in order to buy a home large enough for his family. Clearly, Solomon–despite having profited off his starter home–is worse off. He is struggling to afford a home large enough for his family. Let’s assume Solomon has a cousin who is 10 years younger than him. His little cousin always looked up to him, and when she grew up, she followed the exact same path as he did: she went to the same college to study fur trading, took all the same classes, got the same job out of college–everything. It’s as though Solomon traveled in time from 2017 to 2027. So, it’s 2027, and Solomon’s younger cousin is in the same situation as he was in 2017. Like Solomon in 2017, she wants to buy a starter home. The problem is, she can’t afford to, because housing prices have doubled. Actually, she’s struggling to afford rent, because rising home prices means rising rents. So Solomon made a profit off his starter home, but–as we saw above–he’s worse off than if prices had stayed low (and he hadn’t made a profit) because he’s struggling to afford a larger home to fit his family. And Solomon’s younger cousin and all the people who came of age after the rapid increase in housing prices are struggling to afford shelter. His monthly payments for a $75,000 home are $516.12, versus $635.27 for a $100,000 home. This lower monthly payment quickly adds up to savings for Solomon. After 10 years, he will have paid $61,934.40 versus $76,232.40, or a whopping $14,298 less. After 20 years, he will have paid $123,868.80 versus $152,464.80, or $28,596 less. And after 30 years, he will have paid $185,803.20 versus $228,697.20, or $42,894 less. Clearly, Solomon is better off if housing prices are low and never rise; he’s guaranteed to save a great deal of money if he can buy for a lower price. To make a profit on rising prices, Solomon needs to be extraordinarily lucky; he needs to buy when prices are low and sell when prices are high. But he’s a homeowner, not an investor. An investor would wait to buy a home when she thinks prices are low and about to rise. But Solomon doesn’t think like that; he buys a home as soon as he is in a stable position in life and has saved up enough for a down payment. And an investor would sell when she thinks prices are as high as they can get, but again, Solomon isn’t thinking like an investor; he sells when his family becomes to big for his home and he needs a bigger place. Because Solomon is thinking like a homeowner (and not an investor), if he makes a profit, it will be due to pure luck. In all likelihood, he won’t make fabulous profit, and could even lose money if prices fall. He’s basically gambling. Rather than living in a world with high home prices that could either rise or fall, Solomon is better off living in a world with low home prices that never rise nor fall. His monthly payments for a $75,000 home are $583.29, versus $732.97 for a $100,000 home. After 10 years, he will have paid $69,994.80 versus $87,956.40, or $17,961.60 less. After 20 years, he will have paid $139,989.60 versus $175,912.80, or $35,923.20 less. And after 30 years, he will have paid $209,984.40 versus $263,869.20, or $53,884.80 less. Of course, if rates fell below 6% Solomon would refinance, but whatever percentage we use in sample calculations, it’s nonetheless clear that Solomon is better off if he gets a $25,000 lower price but no appreciation when he sells, versus making $25,000 profit when he sells through torrid appreciation. 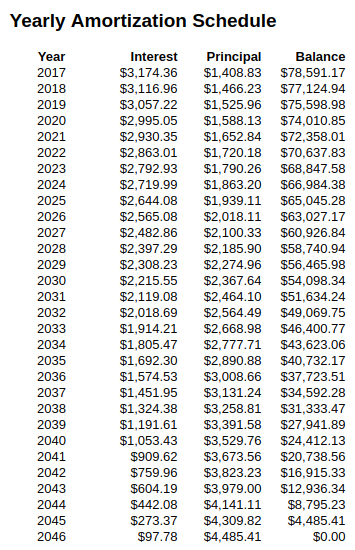 Finally–in this world where home prices are 25% lower and do not rise–the “family home” Solomon will need in 2027 would only cost $150,000 (instead of $400,000). Clearly, a world with low home prices that do not increase is better for the vast majority of homeowners. In the above examples, we were looking strictly at profit–what would the sale price need to be in order for Solomon to recover all the money he put into his home, and more? In reality, homeowners don’t think this way. Going back to the first example (of a $100,000 home), if Solomon sold his home after 10 years and there was zero appreciation (so the sale price was $100,000), Solomon would walk away with his initial down payment ($20,000) plus the amount of principal he had paid off ($80,000 – $66,948.58 = $13,051.42) for a total of $20,000 + $13,051.42 = $33,051.42. In other words, if he sold his home with zero appreciation, he would move out and get a check from the buyer for $33,051.42 (minus realtor’s fees of $4500 to $6000). How does this compare to renting? Had Solomon moved after 10 years of renting, he would never have spent $20,000 for a down payment. But would not be able to recover the additional $13,051.42, as above. Clearly, home ownership is smart money in some cases. The point of this post is not that home ownership is never a smart financial decision. Rather, the point is that a home is not an investment because you should not expect to run a profit from owning a home. You should expect to be financially better off compared to renting, but you should not expect to run a profit. Your home is not an investment. 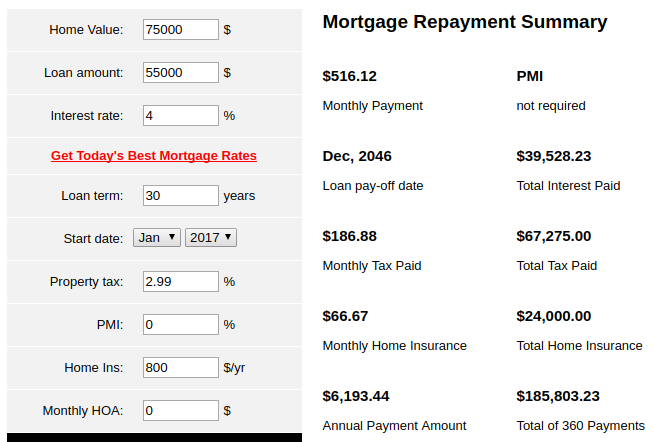 In his first year of paying off the mortgage, Solomon will pay $3,967.95 in interest and just $1,761.04 in principal. That means that for every $1 Solomon pays to his lender, just 31 cents pays off his loan balance and 69 cents is “debt servicing”–interest payments that the lender keeps. As he pays off the loan, the proportion moves into his favor; after 10 years, in 2027, the ratio is 46 cents principal / 54 cents interest; in the last year of the mortgage, the ratio is 98 cents principal / 2 cents interest. Clearly, this explains why a home is not an investment: so much money goes to debt service. Rather than buying an expensive home believing it to be an investment, a typical person would be far better off buying a less expensive home and using that money elsewhere: investments in education or job training, actual investments in a retirement fund, or just to enjoy life with a little extra spending money. In other words, the typical person is better off if home prices are low and stay low. Rising home prices are not good for most people. What if prices don’t rise? Obviously, home prices aren’t guaranteed to constantly rise. What happens to Solomon home prices fall instead? Let’s return to the original example (where Solomon bought a $100,000 home with a $20,000 down payment and $80,000 mortgage at 4% interest rates). What if Solomon’s family needed to move to a bigger home 10 years after Solomon bought the home, but instead of housing prices doubling, housing prices had just collapsed 15%? * Solomon bought for $100,000, but now he can only sell for $85,000. Remember, Solomon needed to sell for $159,259.57 to break even (assuming his repair, maintenance, and other costs were zero). Thus, rather than running a profit, he has run a loss of $159,259.57 – $85,000 = $74,259.57. And we haven’t even considered repairs/maintenance or realtor’s fees. Let’s crunch some more numbers. 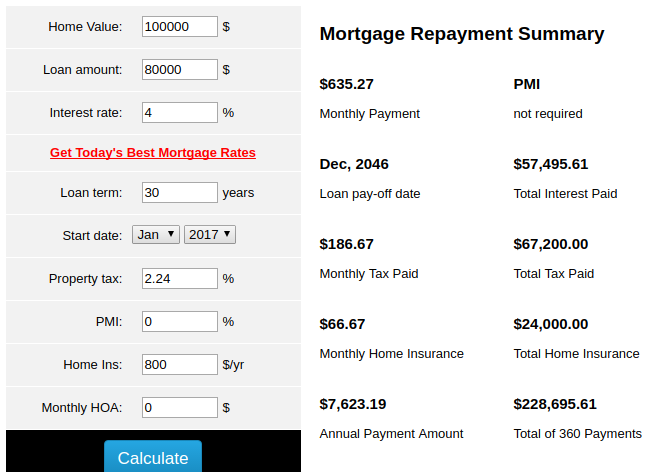 After 10 years, Solomon has a $63,027.17 balance on his mortgage. If he can only sell for $85,000, he will wind up with $85,000 – $63,027.17 = $21,972.83. But remember, Solomon paid $20,000 as a down payment and he owes realtor’s fees. In this case, Solomon would clearly have been better off renting. Of course, Solomon could wait a few years before selling until prices go up, but his family needs a bigger home today. Clearly, the risk of falling home prices is more than we should expect ordinary people to bear. Solomon would be better off if he could somehow give up the possibility of his home price rising in exchange for a guarantee that his home price wouldn’t fall. In 2009, nearly a quarter of all US homes with mortgages were “underwater”–that is, the mortgage balance the homeowner owed to the bank was greater than the value of the home. This occurred because home prices fell dramatically at the end of 2008. Per the most recent statistics, 6% of US homes are still underwater. What would it look like if Solomon was underwater? In past examples, the value of Solomon’s home always exceeded his mortgage balance–that is, he wasn’t underwater. If Solomon was selling his home for $100,000 and his mortgage balance was $85,000, the transaction would go like this: the buyer would have to pay a total of $100,000 in a down payment plus her own mortgage. $85,000 would be used to pay off the remaining balance on Solomon’s mortgage, and there would be $15,000 leftover. That $15,000 would go to Solomon. But Solomon is in trouble if he is underwater. 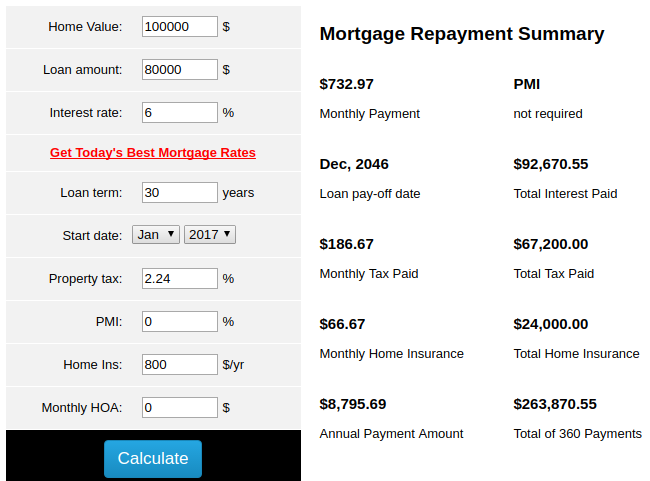 If Solomon’s mortgage balance was $85,000, but he could only sell for $80,000, the transaction would go like this: the buyer would have to pay a total of $80,000 in a down payment plus her own mortgage. So $80,000 would go to Solomon’s lender to pay off his mortgage balance–but there would still be $5,000 of his mortgage left unpaid. In order to sell his home, Solomon wouldn’t get any money from the sale; rather, he would owe his lender $5,000! Additionally, Solomon would owe realtor’s fees, would have paid for necessary maintenance and repairs as he lived there, and would have been making a monthly payment–clearly, Solomon has lost a great deal of money. In the last two examples, Solomon–through not fault of his own, due to forces beyond his control–has lost a great deal of money. Clearly, Solomon is better off in a world where home prices are low and never increase nor decrease, rather than a world with high home prices that could either rise or fall. Conclusion: who benefits from rising home prices? We’ve seen that rising home prices are bad for the vast majority of people from several different angles. First, rising home price are bad for most people because when people sell their home, they tend to do so in order to upgrade their housing (because they have a larger family, or just want someplace nicer). But if all home prices are rising, any profit the family saw from selling their home for a higher price will be more than offset by the fact that the house that they need has also increased in price. Second, when home prices rise, people who aren’t homeowners have difficulty paying increasing rents; they also have a harder time being able to afford home ownership. A homeowner may not be affected by this if she is in her “forever” home, but she will certainly have loved ones who are negatively affected. Clearly, most people would be better if home prices were low and never increased or decreased, versus the world we live in now, where home prices are high and rising, but could fall and leave homeowners underwater. We could live in a world where home prices don’t rise; restraining rising home prices to preserve affordability is the mission of a CLT. However, some people do benefit from rising home prices. Anyone who is wealthy enough to buy a home without having to borrow any money is better off with rising home prices. Because they don’t have to pay any interest on a loan, every penny of rising prices means a penny of profit. Obviously, most people are not so fabulously wealthy. Landlords also benefit from rising home prices. Since a landlord doesn’t live in a home, a landlord needn’t worry about her family outgrowing that home. And rising home prices means that fewer people can afford to own homes, which mean more people must rent. When more people are competing for the same number of units of rental housing, landlords can increase rents. Finally, real estate speculators benefit from rising home prices. Speculators attempt to figure out when something is about to increase in value. They buy that something before it increases in value, then sell it once prices are high enough. But speculators don’t actually add anything of value to their holdings; they simply wait until market forces they can’t control boost the value of their holdings, and then sell. This matters greatly because if we think that homes should be investments, we pursue policies that facilitate a rise in home prices. But that’s simply bad for most people; to benefit the vast majority of people, we should do whatever we can to restrain the growth of home prices. And a CLT is the perfect tool to do so. *From 2006 to 2013, median home sale price fell 40% after adjusting for inflation (and fell 26% from 1999 to 2012).